We absolutely love how fresh and clean this space is. The bright white upper cabinets provide so much light in the room. Your laundry room is a great place to try a fun color for cabinets. We love the dark blue lower cabinets here. All elements of design here are not only timeless and sophisticated but provide such useful functionality. Take a look at the drying racks, so handy you’ll wonder how you ever did without it. We also believe that every laundry room needs a large flat surface to serve as a folding area. No one has ever liked the idea of dumping their laundry somewhere in the house and letting it sit. With a functional space just for folding, you’ll be motivated to take a few minutes and get it done right then and there. How great would it be to have multiple washers and dryers? With a large laundry room, you can make it happen. A great feature to have in your laundry room is to add in a utility sink for any extra soaking or washing. Get creative with this utility sink though! It doesn’t have to look like a utility sink at all, think oversized farm sink. Upgrade all your cheap plastic containers to wicker or wire baskets to hold linens, cleaners, and other items. Display shiny glass jar containers for your laundry detergent, laundry pods, and pet foods. 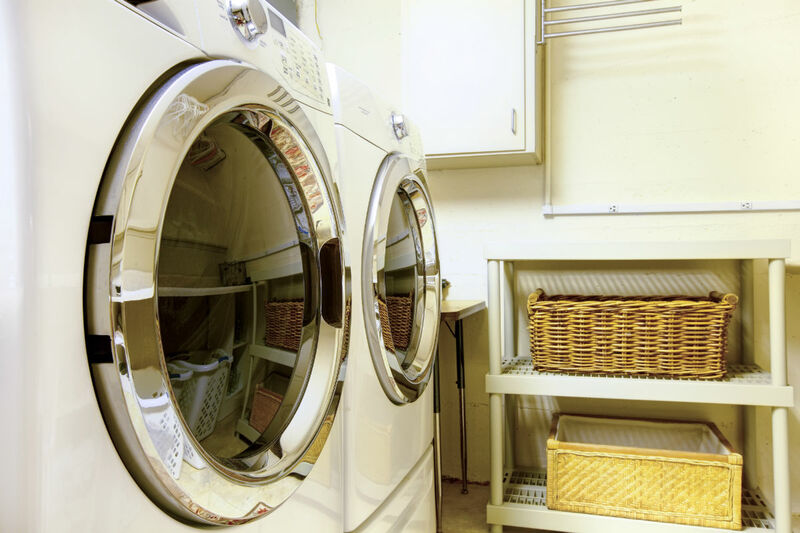 Luxury condo and apartment living in Park City doesn’t always offer a large laundry space but that doesn’t mean you can’t create a dreamy laundry room that offers a lot of functionality too. Stacking machines will create so much more wiggle room in a small space. Doing this allows for more storage and in a smaller living unit storage is a hot commodity. Simple and clean open shelving creates a beautiful element of design allowing you to display sleek storage options that really beautify the space. More functionality is created when you have a place to hang a drying rod or hanging line. Top of your new design by adding a sliding industrial or barn door to separate the room from your living space. This great feature is easy to install and adds the cherry on top of your beautiful laundry room. Regardless of the size of your laundry room, you can have a space that both serves you and excites you every time to walk into it. Take a look at Brad Jensen’s other home design inspirations.